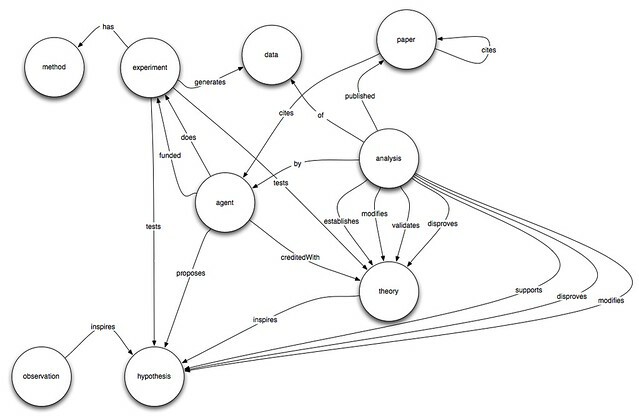 Michael and I did a bit of domain modelling this afternoon – below is our first attempt at a science domain model. It’s almost certainly wrong but I quite like it and I would love to hear what you think, especially if you are a scientist! To give a bit of context – the idea behind the ontology is to provide a relatively high level model to describe the scientific method so that organisations, such as the BBC, could structure their content (archive footage, news stories etc.) using the model. Hypothesis – to quote from Princeton University – an hypothesis is a “a tentative insight into the natural world; a concept that is not yet verified but that if true would explain certain facts or phenomena”. A non-scientist might call this a theory. Theory – again to quote from Princeton University a theory is “a well-substantiated explanation of some aspect of the natural world; an organized system of accepted knowledge that applies in a variety of circumstances to explain a specific set of phenomena.” A non-scientist might think of this as a ‘fact’. Agent – adopting the FOAF:agent this is a person or organisation. Observation – an observed phenomena in the natural world cf “data” an observation resulting from an experiment. As others have already pointed out we’re missing a lot of detail around the role of the agent, we’re missing important predicates, such as other forms of influence other than publication. And looking at it again we’ve failed to include anything about the predictions a theory might make of the natural world. But what else are we missing? Also, your ontology states that an analysis can disprove a theory. While this is of course correct, such a thing then ceases to be a theory, and becomes something else. A better term might be “conflictsWith”, this conflict can then be resolved with further investigation. A disproven theory concept might have a place in the ontology, but it is disjoint from the theory concept. We need to expand out the agent/team/project bit for sure, it’s all a bit simplistic at the moment. I think we need both agent writes and agent cites a paper. I like the conflictWith predicate – thanks. I think it’s good, in principle. I’d like to see the item “concept” in your scheme, strongly liked to the theory and hypothesis. Also, this scheme gives an impression of “one-direction” information flow only. What I mean is that it’d be very useful for one to see feedback loops. Thanks Christos – do you have an example of a concept? and how it differs from hypothesis and theory? It’s not intended to be a one way flow of information – a theory can be tested any number of times and at each instance the experiment would support or otherwise that theory. Theory. What about Principal, and Law? It’s Newton’s Laws (superceeded). The Uncertainty Principal. The Holographic Principal. The Theory of Evolution. And then we have speculation like String Theory. What a total mess, especially for the pubic. I’ve seen “scientific fact” instead of observation. I think i like observation better. There’s some karma to work out with “data” too. In astronomy, sometimes you get to do an experiment. But more likely, you do observations, perhaps inspired by an hypothesis. Sometimes the observation is one you might have wanted to do ages ago, and technology has only more or less made it possible. So, you can say the experiment is inspired by technology. This is really complicated. The real processes is ‘whatever works’. I think the theory/ principle/ law distinction is more a problem for the non-scientist – using the above ontology we have: newton’s theory of gravity, Darwin’s theory of natural selection and String Theory is really a hypothesis (no experimental evidence). Principles are properties of a theory (e.g. the holographic principle is a property of quantum gravity). In this sense there are no scientific facts since all ideas are able to be challenged and disproved (with evidence). In what way is an astronomy observation not a type of experiment? In that an astronomer does the observing in a structured, repeatable way hoping to probe an existing hypothesis?